Fuses protect your car from electrical short circuits and power overloads that can damage equipment or start a fire. Often, a fuse will blow due to a momentary overload, and replacing the bad fuse as directed below will fix the problem (the car's horn or interior lights may cease to work, for example). If a fuse blows repeatedly, it indicates an electrical problem that will require a little trip to your Lotus Dealer. The wires can corrode on the reverse of the fusebox and break off. If this happens new clip in fuse terminals can be sourced from Smart car dealers, part number 011 545 84 26 or 004 545 52 26, both parts numbers are correct. Simply solder them onto the wire and push fit them into a spare socket in the fusebox, then mark up your handbook with the change. Never replace a fuse with one of bigger amperage. This could damage the device the fuse is meant to protect. 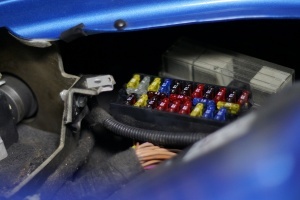 The main fusebox is located in the front under the bonnet, on the passenger side, and is protected by a plastic cover. Twenty two slots are provided for standard size 'Littelfuse' 257 series blade fuses which are numbered, and coloured according to their amperage rating, and may be pulled out from their slots using the fuse extractor tool provided on the fusebox lid. Early Elises (pre Oct 97) have several fuse boxes. The main one is located on the left hand side of the front services compartment. A smaller fuse box is located underneath the windscreen motor cover. The fuel pump fuse is located near the ECU at the rear of the car. In the later bootbox cars, there is a 20A fuse inside the engine compartment but accessible through a hole under the carpet on the LH side near the inertia switch. In earlier cars, there is a 10A fuse inside the boot next to the ECU. Also on the Elise are three Maxi fuses. Two maxi fuses are located in the front service compartment, beneath the wiper motor protective cover. There is a third 40A maxi fuse for the engine management system, including the starter motor relay. Prior to about February 1997, a 1.0 kW starter motor was used and the maxi fuse is in the boot next the ECU. Later cars have a 1.4 kW starter motor and a maxi fuse under the wiper motor cover. Twenty two slots are provided for standard size 'Littelfuse' 257 series blade fuses which are numbered, and coloured according to their amperage rating, and may be pulled out from their slots useing the fuse extractor tool provided on the fusebox lit. Fuses and relays associated with the engine management system are located at the rear of the engine bay adjacent to the engine ECM. The mulit-function relay unit containing the engine control relay and starter relay is mounted on the chassis rear subframe below the engine ECM. The main fusebox is located in the front services compartment, on the passenger side, and is protected by a clear plastic cover. For access, remove the passenger side front body access panel, followed by the radiator air deflector panel. Twenty two slots are provided for standard size 'Littelfuse' 257 series blade fuses which are numbered, and coloured according to their amperage rating, and may be pulled out from their slots useing the fuse extractor tool provided on the fusebox lit. The wash/wipe module, turn/hazard flasher relay, horn relay and a relay for inertia switch activation of the central door locking, are mounted on the scuttle beam above the passenger footwell, with four fuses secured to the harness in that area. A 60A Maxi fuse protecting the ABS circuit is located beneath the passenger side fascia top, adjacent to the positive post. A multi-function relay unit containing the engine control relay, fuel pump relay and starter relay is mounted in the engine bay near the ECU. A similar relay unit is mounted in the front services compartment alongside the fusebox, and operates the a.c. compressor and radiator fans. Important Note: Although the two modules are identical in appearance, their function is different and they must not be transposed. 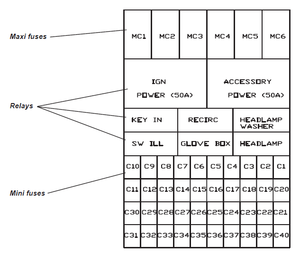 The A.C. relay module A117M0038F has a brown label marked YWB100800. The engine relay module A111E6024F has a white label marked YWB100970. 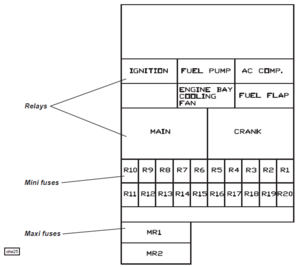 Fuses and relays associated with the engine management system are contained in two 4-position fuse holders located at the front of the engine bay on the cabin bulkhead, adjacent to the engine ECM. To access the fuses, unclip rear edge of the cover. The main fuse and relay boxes are located at the front of the passenger footwell, protected by a removable panel secured by a quarter turn fastener at each top corner, and a location channel on the floor. Forty slots are provided for mini fuses which are numbered, and coloured according to their amperage rating, and may be pulled out from their slots using the fuse extractor tool clipped to the fusebox. Six maxi fuses protecting major circuits are also provided, along with six single contact change over micro relays and two 50A power relays. Fuses and relays for the engine bay and rear mounted systems are contained in a fusebox mounted in the cabin, behind the left hand rear quarter trim panel. For access, use a coin to release the quarter turn fastener on the lower edge of the removable panel, and unhook the top edge. Twenty slots are provided for mini fuses which are numbered, and coloured according to their amperage rating, and may be pulled out from their slots using the fuse extractor tool clipped to the fusebox. Two maxi fuses protecting major circuits are also provided, along with four single contact change over micro relays, and two power relays. This page was last modified on 26 March 2019, at 15:33.